I hope the incoming administration will honorably hand over the housing units from Hulhumale’ Phase II to those selected, says Minister of Housing and Infrastructure, Dr. Mohamed Muizzu. The Housing Ministry released the permanent list of winners of the housing units from several categories under the Hiyaa Housing Project last Sunday night. Speaking during a press conference this Monday morning, Muizzu said the ministry compiled the permanent list will all due integrity. He said he hoped the President-elect Ibrahim Mohamed Solih (Ibu) will ensure the housing units are handed over to those selected, and that the remaining housing units under the Hiyaa Housing Project are constructed during his administration. Muizzu announced that construction of the first 7,000 housing units will be completed in June or July of 2019. And said construction of the additional 2,500 housing units will be launched soon. He said he hoped the incoming administration will continue with the projects. “The comments directed at me and the current administration is untrue. 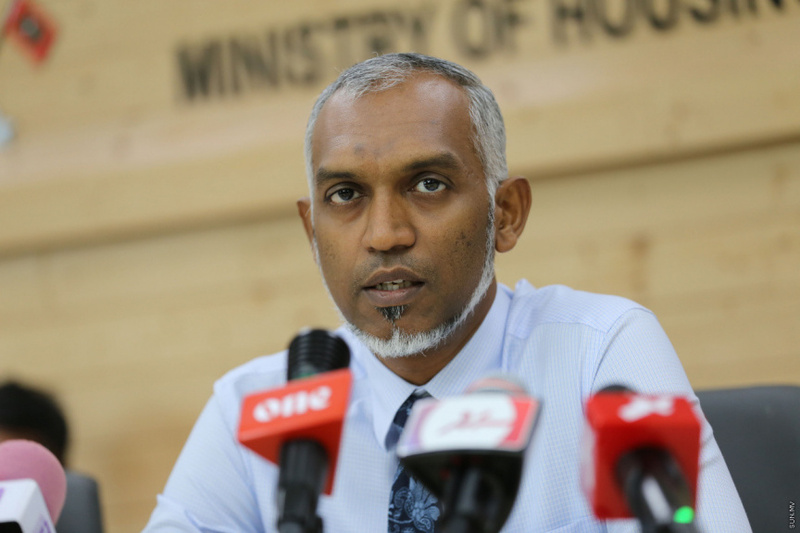 I have not taken any action to ensure the housing units go to specific people,” said Muizzu. “I haven’t considered anything else [except for the conditions for application]. We don’t look at the political party the person belongs to, or his or her political activism,” said Muizzu, responding to allegations the selection process for the housing units was compromised. Muizzu said the ministry received complaints from 3,000 citizens regarding the provisional list. And that he made sure each complaint was reviewed twice by two different employees. He said that some names in the provisional list were not included in the permanent list. He said the names removed were those with invalid information in their applications and those who have already received housing under a State housing scheme. He said the ministry has also removed names of either the wife or husband of applicants if both spouses were selected. Muizzu went into detail and said the ministry removed names of 46 applicants from the category 18-40 years for inauthentic information. More than 22,000 people applied for the Hiyaa Housing Project; 11,000 of them have made it to the permanent list.